Without question, family law concerns are immensely emotional, complex and challenging. While the future can be uncertain in the face of these issues and the way forward can be confusing, these issues can provide the opportunity to move forward — to a place of elevated health and stability. 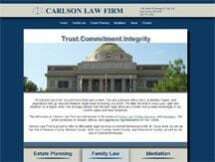 If you and your loved ones are facing family law concerns in Saint Cloud, Minnesota, or the surrounding areas, Carlson Law Firm, P.A., is here for you. Our attorney and team are dedicated, foremost, to helping families arrive at best-possible outcomes to their unique family law issues. In practice, this means every member of the firm who works on a case strives to get to know the client personally. As such, we provide free initial consultations over which a client can understand his or her rights and options, as well as how we can help them address all issues. Throughout every case, ongoing clear communication forms the bedrock of our approach. We understand that only when clients understand their options and rights are they empowered to make the best decisions for their family.